Keeping your kayak intact and safe when going down to enjoy some time in the water is a top priority for any kayak owner. As a Subaru Forester owner, you need to know the specific kayak racks that will be suitable for your vehicle. This is because the features of kayak racks will be used depending on the roof base of the car. In this article, we will discuss some of the features to look out for as a Subaru Forester owner, as well as some of the top rated kayak racks in the market. Buying a rack for your kayak is not as easy as it sounds. A number of issues need to be considered first to avoid disappointments later. In this article, we are going to cover a few features that you need to consider and look out for when buying a rack for your Subaru Forester. The roof of your car plays a big role when determining the type of rack to buy. Some cars have a bare roof, others have factory side bars, and some will have aftermarket crossbars, while others have side rails. A bare or naked roof top or one fitted with just side rails will require you to get a rack with foam pads or one that is inflatable to help support your kayak. Luckily enough, a Subaru Forrester has crossbars, which allows you to get the most advanced carriers made just for the purpose of carrying kayaks. With a Subaru Forester, gear mounted racks such as j-cradles, saddles, and stackers will be ideal. The design of a Subaru Forester is designed to allow one to carry up to two kayaks. If, of course, you are carrying more than two kayaks, you will need stackers to make it easy for you. Driving long distance or within the state? If you will be driving long distance to test new waters then you need strong and durable racks for your kayak. Temporary pads should not be on your list, as well as foam pads. This applies when driving on a rough road too. Do you go kayaking on a regular basis? Or is it an activity you do once in a while? If you go kayaking on a regular basis like daily then you need a rack that spares you the headache of loading and unloading your kayak all the time. To beat this, you need a pair of rollers at the back and a pair of saddles on the front to haul the kayak with. 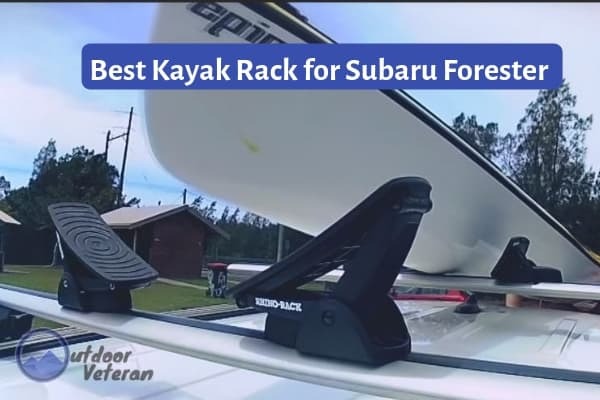 Bottom Line: ​If you are looking for a rack that is built by engineers with kayaking experience, and one with advanced technologically and is easy to load to your Subaru Forester from the rear, then the Nautic 581 is one of the best Kayak racks to go for. ​It is corrosion resistant and can be used near salty water bodies. ​Has 2 tie-down and 2 rapid straps with buckle protectors to protect the kayak. ​Fitted with 2 rubber pads on the front to provide cushioning. It is corrosion resistant and can be used near salty water bodies. Has a secure core locking system to keep the kayak in place and protects it from theft. Master key compatible making it easy to upgrade the locks of your rack and saves one from carrying multiple keys. Can only be used in crossbars with an internal channel. ​Manufactured by Rhino-Rack in Australia, the Nautic 581 series incorporates the latest technology in rear loading kayak designs and styles. It also comes with a 5 year warranty! The Nautic 581 has a secure locking system – a lockable cover plate- that helps you lock the kayaks safely onto the crossbars of the Subaru. This helps in minimizing theft. To even offer the kayak more protection, the rack has 2 santropene rubber pads on the front for excellent cushioning. The 2 spring cover pads on the rear makes mounting the kayak easy. Additionally, you do not need to buy other necessary items such as keys or down straps since they are part of the Nautic 581. In case you need instructions to follow on how to use the racks, an instructions manual is also available and comes with the rack upon purchase. For a kayak rack that is designed by kayaking experts who are also engineers, this is the rack to go for. It is also rust resistant, waterproof, mould resistant, has UV protection and is compatible with a Master-key for people who do not want to carry a bunch of keys around. Bottom Line: ​Depending on the weight/s of your kayak/s, this is a rack you can use to carry even 2 kayaks that weigh 110 lbs. or less combined on vertical position, and comes with a limited lifetime warranty! ​It is made of silver powdered finish that helps in resisting corrosion. ​Comes with tie-down straps for one kayak to secure the kayak in place. ​The bases and arms are padded to offer excellent cushioning. ​Carries one kayak of up to 80 lbs. or two of up to 110 lbs. ​It is easy to mount the kayak because it has built-in ramps. ​Has built in ramps that makes it easy to load the kayak onto the Subaru. ​Comes with only one pair of straps and stern tie-downs for a single kayak. ​For a kayak rack that comes with limited lifetime warranty and carries up to two kayaks of up to 110 lbs. at a go, this will not be a bad investment for your Subaru Forester. The Yakima Jaylow is a J-Style kayak rack is flexible enough making it easy for you to fold it for storage purposes. For easy mounting onto the roof of the Subaru, it has built-in ramps. The padded arms and bases of the rack help in providing excellent cushioning, which also protects your kayak from any damage such as scratches and providing more grip. It comes with tie-down straps and stern tie-downs that help secure one kayak in place once it is loaded. In case you are taking to kayaks with you, you will have to purchase a second pair of straps and stern tie-downs. This kayak rack is also rust resistant, thanks to the powdered, silver coating used in making it. Bottom Line: ​Designed for a wide range of water crafts, the Rola 59912 is durable, with heavy duty straps that help keep your kayak intact throughout the journey. ​Made of powder coated steel that makes it strong, durable, and rust resistant. ​Has long, strong, and durable tie-down straps that keep the kayak intact once mounted. ​Has foam pads for excellent cushioning of your kayak, it has foam pads. ​Carries one kayak and leaves robust space for fitting other items you might have. ​It is rust resistant and will not be affected by salty water. ​Easy to fit by hand using the wing nuts. ​Has strong, and durable straps with foam pads to protect your kayak. ​The steel material is strong and durable. ​It does not fold making it hard to store it unless you take it apart. ​For a J-style kayak rack, the Rola 59912 is one of the best kayak racks to go for. It has a clamp on design and has fixed arms, as well as robust capacity that allows you to carry additional items on the roof of your Subaru Forester. The Rola 59912 is built with rust resistant, strong and durable powder coated steel. It has long rubber straps for holding the kayak together when tied. In addition, the straps have foam pads that offer additional cushioning to your kayak. The straps are among the strongest straps for kayak racks, and will serve you for long. For a kayak rack that has robust capacity, is durable and leaves you enough room to carry other items on the roof, the Rola 59912 is the kayak rack to go for. Since protecting ones kayak when going down to enjoy the waters is a top priority, it is okay for anyone to worry and want the best kayak rack out there. For a Subaru Forester owner, the same is applies since you need to shop for a rack that goes hand in hand with the crossbars of the Subaru. It is also important to pay attention to the features of the rack such as rust resistance, its durability, the strength of the straps to avoid cases of the kayak falling off, as well as the simplicity of loading the kayak using the rack. This article has provided you with a few options to consider and we hope you will have an easy time shopping. We have had a Forester and 14-1/2 foot tandem kayak for three years. We use the Yakima Sweetroll carrier. I can load this 78 pound kayak all by myself. It just rolls right on from the rear of the Subaru, after I perch the front of the kayak on the rear of the Forester. It works great.